Toddler Approved! : Announcing.... Our Year-long Virtual Book Club for Kids! 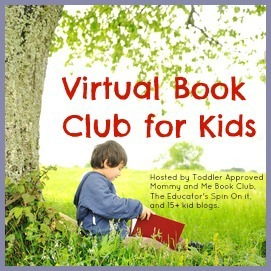 Announcing.... Our Year-long Virtual Book Club for Kids! I am totally excited about today's announcement! I worked together with several other bloggers over the summer to put together a Summer Virtual Book Club... and we've had so much fun that we decided we want to keep it up ALL YEAR LONG! Each month we will spotlight a new author and each participating blogger will pick a book to focus on that month. We'll share book related crafts and activities at the end of each month and we'd love to invite you to join in! My co-hosts, Danielle at Mommy & Me Book Club and Kim at The Educators' Spin On It, have worked together with me and several other kid blogging friends to put together this amazing list of authors for us to focus on this year! Check out the list below and a few books I am highlighting by each author. You can click on each book to read a bit about it. Did we happen to pick any of your favorite authors? If so, which one is it? Hopefully there are some authors that you don't know very well that you can explore and learn to love this year too! So, are you going to join this year's Virtual Book Club? Pick your favorite book by that month's author (or a new one you want to check out) and read it with your child or class. Come back and share it with us as part of a big blog hop on the third Monday of the month. The linky will be live for 3 weeks, so if you aren't ready to post on the exact date... just join in when you can! If you don't blog, you can share what you did on our Facebook wall, email us, or just comment on the post. We'll be be posting reminders at the beginning of each month to help you remember which author we are spotlighting! So, if you're joining in... start reserving some books at your library right now! Or, if you're like me and can't ever remember to return library books, start looking for cheap books online! I can't wait to see which books you choose to explore. If you've missed any of our Virtual Book Club posts yet, you can find them all here! Thanks, for organizing this! We have enjoyed exploring authors and discovering new favorites. Amazing! We are so looking forward to this monthly event. Cheers. I am super excited to participate! I can't wait to introduce my little one to Tomie de Paola's Strega Nona! (I'm thinking cooked spaghetti sensory bin!) I love the art in Jan Brett's books and Donald Crew's Freight Train is one of my son's favorites! Great idea!! I am joining! I do an author each month in my classroom and you have picked some I already do!!! I am eager to join! Joining! This is the best idea yet!! sounds like a great idea..my daughter will love this! Great idea! I would love to join. I teach preschool and we do our lesson planning around favorite books. I am in the process of designing some projects for the next few months of at-home preschool (my kids are 2.75 and 1.5), and I love this idea. We'll join in! I look forward to seeing (and using) some of the posted projects later in the month! We will join in -- I can't wait to share projects! Joining! This is such a great idea and my 2yo daughter will love it! seb and i are in! I'm trying to get my blog back up and running now that things have slowed down ...I'd love to join from chestnut grove academy!! I don't blog but my 2 yr old and I will be joining your book club. I just need to figure out the activity/craft for each story. Joining in! Looking forward to it! I love this idea! Let me know if there is something I can contribute. I look forward to seeing the book-inspired activities you come up with. So excited to join in! Some new authors to explore, which I am very excited about! Thank you for the opportunity! Count me in! There are some new authors I am looking forward to explore with my tot! Thank you for the opportunity. Joining in! This is going to be fun! Great idea! We will be joining in. Our favorite author right now is Sondra Boynton but we are looking forward to discovering new authors. Can we use different books by the same authors? Hi Jen- Of course!! We are spotlighting the authors, not the books. These are just some examples of books from the author that you could use. We were highlighting a few of our favorites. Can't wait to see what you choose! We're so excited about the Year Long Virtual Book Club! So great to see so many signing up to join the fun! Can't wait to see what everyone shares. Thanks Kristina for getting all of us together for this project! My boys and I are all in! What an awesome idea. Awesome! I am planning to join in as long as other areas of life don't take over! :D Thanks!! We're joining!!! Thanks so much!!! Lucy, Ruth and I would love to join! I am excited to participate with my 20 month old son! I just found out about this, and am so excited to join in the fun! I have two kids and a small in-home daycare that I'll be sharing activities from! Thanks so much for hosting!! Would love to join in. My 2 and a bit year old is a story book fiend. We would love to join as we did in June July and August. It was great fun and so educational. I shall be joining in! Late... but I'll be joining beginning with the November club. It's going to be fun to find activities related to the books for each of my ages -- 10, 5, and 3. Lookng forward to the fun. I love this idea. Just found you today by chance coming off of another blog. My daughter and I will be joining you starting this month. Already reserved the book at the library and plan to start this week. My daughter is so excited. I just saw this on another blog and I would LOVE to join in! I'll pull together something for this month and have next month's book and activities all ready to go!!! What a great idea!!! My daughter and I will joining you starting this month. I wish I would have found this sooner. Jumping in for April. We already picked our book and what we are doing with it. I will love to join. Wished I found this earlier in the year. Thanks for all the great information. Sure helps alot. I would love to participate in the next one! I too want to join in on the next one. Also liked your Facebook page. I have been trying to do this on my own so I am very excited to join other parents. I want to join in on the next one too. I have been trying to do something similar on my own so I am very excited to participate with other parents. Thank you! Yes most definitely, my toddler would love this!